A boy aged 2 years presented with a swelling beneath the skin of the lower back, incontinence, bilateral leg weakness and a history of bilateral hip dislocation at birth. Physical examination revealed a fatty mass in the lumbosacral region. There was muscle wasting of the lower limbs and grade 3/5 power of the knee flexors and extensors. All reflexes in the lower limbs were absent and sensation was reduced below the knees. Levels of carcino-embryonic antigen, alpha-fetoprotein, and beta-human chorionic gonadotrophin were within the normal range. An ultrasound examination of the kidneys was normal. Elective surgery was performed to excise the mass and to release the spinal cord; the filum terminale was divided and the neural placode was replaced in the spinal canal. 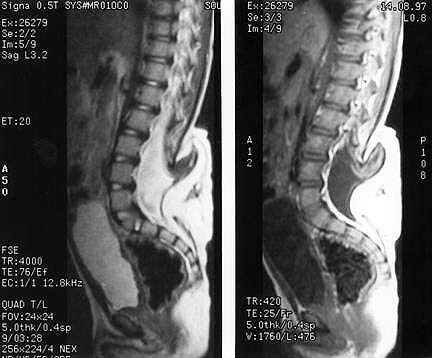 Magnetic resonance imaging (Image 01) revealed a wide posterior fusion of the vertebral column (spina bifida) extending from L4 to the sacrum. A cystic structure protruded through the defect, and the folded neural placode could be seen at the level of L4.